Hawaii Governor David Ige places the State Medal of Valor around the neck of Staff Sergeant Gregory A.Y. Lum Ho, Jr. at a ceremony held on February 9, 2019, at Wheeler Army Airfield, Hawaii. On August 23, 2018, as part of the Hawaii National Guard’s response to Tropical Storm Lane, Staff Sgt. 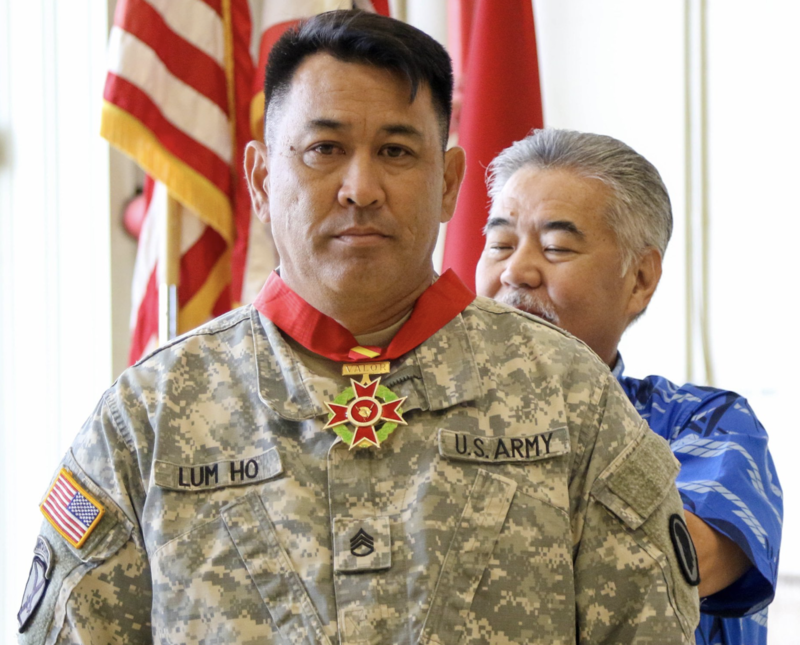 Lum Ho disregarded a substantial risk to his own safety by maneuvering his Humvee through dangerous hip-high rushing water to reach a family that had been cut off by the flash flood waters brought on by Tropical Storm Lane. While risking his own life, Staff Sgt. Lum Ho’s actions saved the lives of six civilians and one family pet. « No Need to Speed!